A few weeks ago I mentioned the iFilm PowerPoint contest. 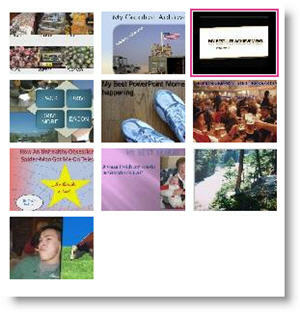 The went through all the entries and came up with the finalists for everyone to see and vote on. Well, today is the final day to cast your vote – click here to see the finalists and cast your vote. I cannot say any of these presentations really jump out and wow me… My personal favorite, primarily because it made good use of many of the PPT 2007 effects (like the opening text) and lots of good animation (always something I look for!) is the “My Best Life Achievement” entry (and it got my vote). First I set the upper-left and lower-right cells to no fill (note the text in the upper-left is now the same color as the background and cannot be seen). Second I created two rounded corner autoshapes. Each filled with same color as the table background and sent to back. I then positioned them to align with the edges of the table. Finally I grouped all three elements so they could easily be moved. The final result is a table with two rounded corners. Tables contain lots of data – but often they do not blend with a presentations overall color scheme or design cues. Here is one example from a recent project that incorporated both the color scheme and design elements. I filled the header bar with same color used for the bullets, bold text, and slide title area. The body of the table is filled with the presentation secondary color that was used throughout on several elements. The upper-left and lower-right feature rounded corners. Circles and rounded corners where a major design element throughout the presentation. Up Next: How the rounded corners where created. Ran across this well written article about PowerPoint and sales presentations. The content really applies to any speaker support presentation. I have never heard of Reliable Planet, but they definitely allowed one of their writers to hit the mark with an accurate and well written piece. Worth reading and bookmarking. Last week while developing an OFX based awards presentation (OfficeFX is a 3D****) I needed to convert provided Quicktime movies to a supported format. No problem, open each movie in Quicktime Pro and Export to an .avi. WRONG – export errored out. I then spent the next several hours troubleshooting by installing, uninstalling, hacking option settings and registry entries – nothing worked. A few days later I figured out the problem. I have been taking advantage of Vista’s ReadyBoost technology (using a USB memory stick as an extended memory cache). Turns out Quicktime’s export feature is not compatible with ReadyBoost. Remove the USB memory stick – export movies from Quicktime Pro. Now you know too. 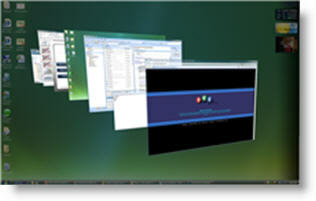 I often run PowerPoint with an extended desktop setup with PowerPoint in the design or slide sorter view on the local monitor and presentation/slideshow on the external monitor. One of the downsides of this setup is that if I cannot see the external monitor/projector I do have an indicator of what slide I am actually on. I can also use these active thumbnails to show me exactly what slide is active on an external monitor! By rolling over the ‘Slide Show’ tab it pops up a live thumbnail of the current slide. What’s even more hip is that the thumbnail will also show the animations in real time. The final element was to create a placeholder for the financial information. I added another custom fill autoshape, this time a rectangle. After sized it was ‘sent to back’ and the appropriate text was added. If you would like to download this slide, click here. Because the globe is an animated .gif, not a Flash or movie file we are able to overlay elements (Flash and all movie formats always play on top of all PowerPoint content). The green semi-transparent circle overlay is the first layer. The next layer was each division logo – in this case I have added the TLC Creative logo. The Problem here is that the logo is a bit flat and the black text is lost. Again, the solution was using a PPT autoshape. This time I created a glow, which was simply a white circle with a custom fill from center. Here is one done in blue (so it can be seen on this white background). The result is a nice highlight spot that not only makes the logo text legible, but adds a 3D element to the overall globe. This week Google made an integrated PowerPoint viewer option to its online tools. Basically if you receive a PowerPoint presentation in a gmail account, there are a few options for the attachment; view as HTML, view as Slideshow, and download. Of course the key new option is VIEW AS SLIDESHOW. Hurry and PPT 2007 Can Pay Big! 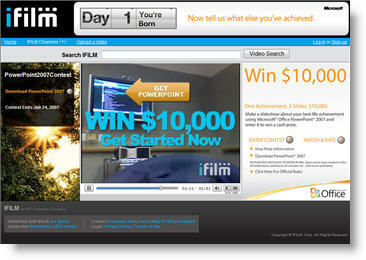 iFilm.com is hosting a Microsoft PowerPoint 2007 contest. Rules are simple, submission is simple, deadline in June 24th – so hurry!